Church of Jesus Christ of Latter-day Saints, Record of Members Collection. Ohio. CR 375 8. Box 34, folder 1, image 264-265. Box 36, folder 1, image 400. Box 5009, folder 1, image 303. Box 5010, folder 1, image 20, 49, 307. Church History Library, Salt Lake City, Utah. Hanks, Marion D. Oral interview. MSS 7752. Charles Redd Center for Western Studies oral history project records. L. Tom Perry Special Collections. 20th Century Western & Mormon Manuscripts, 1130. Harold B. Lee Library. Brigham Young University. Provo, Utah. Stephenson, Loran. Oral interview by Jessie L. Embry. 1989. Charles Redd Center for Western Studies oral history project records. L. Tom Perry Special Collections. Harold B. Lee Library, Brigham Young University, Provo, Utah. "Hope," Presiding Bishopric stake and mission census, 1914-1935, CR 4 311, Church History Library, Church of Jesus Christ of Latter-day Saints, Salt Lake City, Utah. Church of Jesus Christ of Latter-day Saints. Record of Members Collection, Alabama, CR 375 8, box 34, folder 1, image 264-265; box 36, folder 1, image 400. Church History Library, Salt Lake City, Utah. 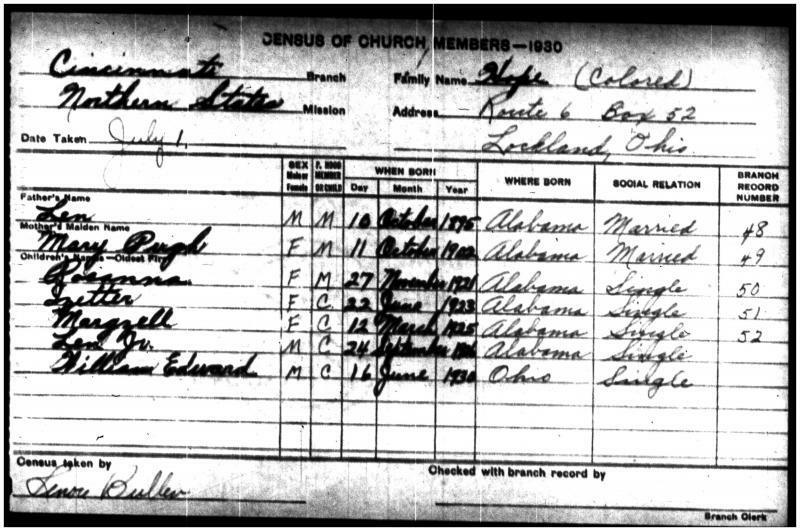 "Hope," Presiding Bishopric stake and mission census, 1914-1935, CR 4 311, July 1930, Church History Library, Church of Jesus Christ of Latter-day Saints, Salt Lake City, Utah. For the rest of the family’s baptismal records see Church of Jesus Christ of Latter-day Saints, Record of Members Collection, Ohio, CR 375 8, box 5009, folder 1, image 303; box 5010, folder 1, image 20, 49, 307, Church History Library, Salt Lake City, Utah. Loran Stephenson, oral interview by Jessie L. Embry, 1989, Charles Redd Center for Western Studies oral history project records, L. Tom Perry Special Collections, Harold B. Lee Library, Brigham Young University, Provo, Utah.